Episode Summary The Holy Inn Brewing Company is back up and running! In this episode of Homebrew Wednesday I first pour a full glass of my imperial stout and share some brief tasting notes. 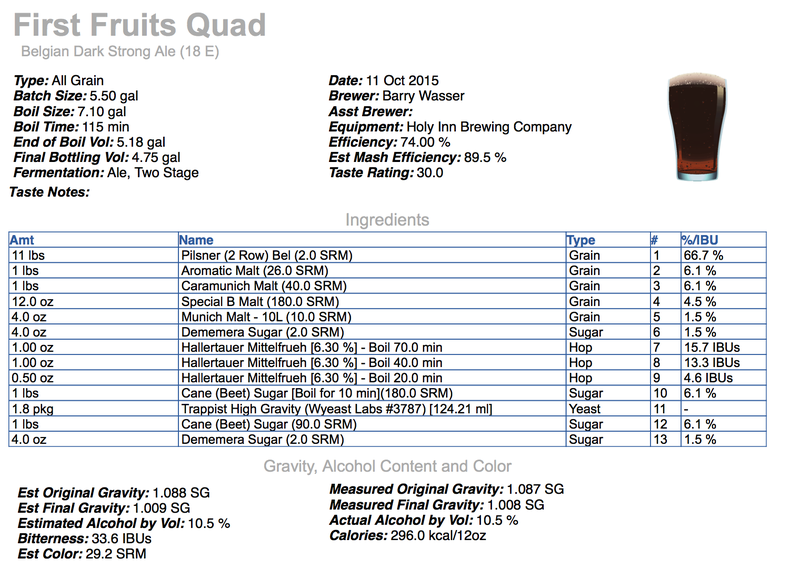 Then I move on to footage from Sunday, October 11th – First Fruits Quadrupel brew day. Enjoy and Cheers! After a panic stricken mash process when I first tested out my new mash tun. I decided to revert back to my time tested mash/sparge processes in order to see if I could achieve the same mash efficiency that I was achieving using my cooler mash tun . My “time tested mash/sparge process” includes: Preheating the mash tun, doughing in, stirring the grain at least twice during the mash to eliminate hot/cold spots, vorlaufing then running off most of my first runnings, adding /stirring in my mash out water, doing a 10-15 minute mash out rest, running off my second runnings slowly while fly sparging. With this brew I ran off my runnings extra slow to make sure that I’d hit my target preboil gravity and thankfully I was able to hit my exact target gravity of 1.060 SG (w/o any of the added sugars). I should note that one additional factor that made my run off slower than usual was that at times I felt that opening the mash tun ball valve half way caused the run off to flow too fast for my liking, but opening it any less than that caused the run off to flow slowly and then stop after 5-10 minutes. Next time I’ll have to find a happy medium to shorten the run off / sparge process a bit. As mentioned in the above video, one thing I noticed was that the mash tun’s thermometer went up help a degreeF once I starting running off my first runnings, which to me meant that I did not lose as much heat as I had originally thought. If my assumptions/observations (I performed spot checks using my usual digital thermometer throughout the mash) are correct, I only lost just over a degreeF during the mash (watch video for full details). While I think it’ll take another brew day to give my “final verdict” on my new mash tun I’m quite satisfied with it so far and am thankful to have teamed up with Ss Brew Tech whilst I continue developing my brewing knowledge and skills. My first goal for the recipe was to have its grain bill complex enough to lend itself to giving the beer the potential to age well. Therefore, after looking over many recipes that I found online and in print, I decided to go with 15% simple sugars instead of leaning towards an amount in the upper teens or even twenty percent. I went for Demerara sugar instead of table sugar because I like it’s molasses/caramel aroma and along with the D180 and D90 candi syrups I hope it ends up adding some nice complexity to the final product. While the mash started at 151F, it was stable at 150F for most of the mash rest. I also used more sparge water than is listed above…Even after I started off with a pretty high grain to water ratio. I decided to split the sugars between the last 10 minutes of the boil and the morning of day four of primary fermentation in order to better ensure that the beer/wort would attenuate down to my target FG (1.009). Note: The 1.008 noted above is just the FG that I input into Beer Smith to check what the beer’s ABV could potentially be. Yeast Starter: 2 smack packs of Wyeast 3787 Trappist High Gravity pitched into a 2.2 liters of starter wort. The hottest that I let the fermentation get was 74F (yeast strain’s high end of 78F) in order to make sure that the final beer doesn’t have too much fruity esters. In other news: I’ve added a new page to thebrewedpalate.com called “Coffee Journal” (above in blog header). Having started getting into drinking and brewing specialty coffees over the past 5-6 months, I decided to chronicle my coffee experiences on my blog. For now I’m going to keep my posts on this “separate page” in order to keep my homepage focused on homebrewing and craft beer related topics. However, in the future this arrangement may change. This entry was posted in Uncategorized and tagged belgian quad, belgian quadrupel, homebrew wednesday, Homebrewing, InfuSsion mash tun, quadrupel recipe, specialty coffee, Ss Brew Tech. Bookmark the permalink.